Have you tried it with spicy vinegar? It makes it even more awesome. crack...crunch..crack...(sip of something liquid and cold)...burp...(repeat). I actually find the spicy vinegar packet inside kind of distracting! But that's just me. However, I've yet to make my own out of Datu Puti and some chilies! That would work much better! I've considered using Mag Tomas Lechon sauce for these...because they're really close to lechon kawale! 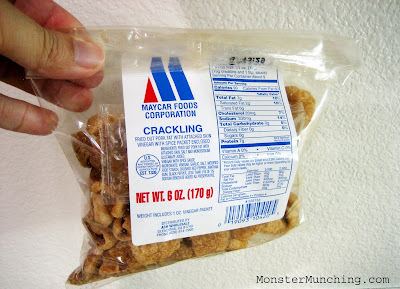 That's crazy...I was just thinking to myself today that the best meat product or meat part is the "cracklings." now I cam buy some! If you find these babies anywhere else but Magic Wok, be sure to let me know! I probably shouldn't have convenient access to them, but it'd be nice not to drive all the way out to Artesia. This reminds me of my MW visit a few months ago on an empty stomach. I knew food would take a while so I had some of these for appetizers to complete my pork goodness "trifecta" (to borrow your word) -- chicharons, crispy pata and sisig. You must carry a pocket size defibrillator. I don't have these on my to buy list but I believe I've seen them at Sea Palace (now UniMart), Seafood City, Island Pacific, American Ranch, Tambuli and some turo-turos. I'll keep an eye out for them when I go to those places and will let you know. I was thinking about you yesterday 'cause I went to Holland America and picked up some goodies and a jar of Hot Sambal Cobek Terasi. I might just add some to Poke if my California Fish Grill has it here. 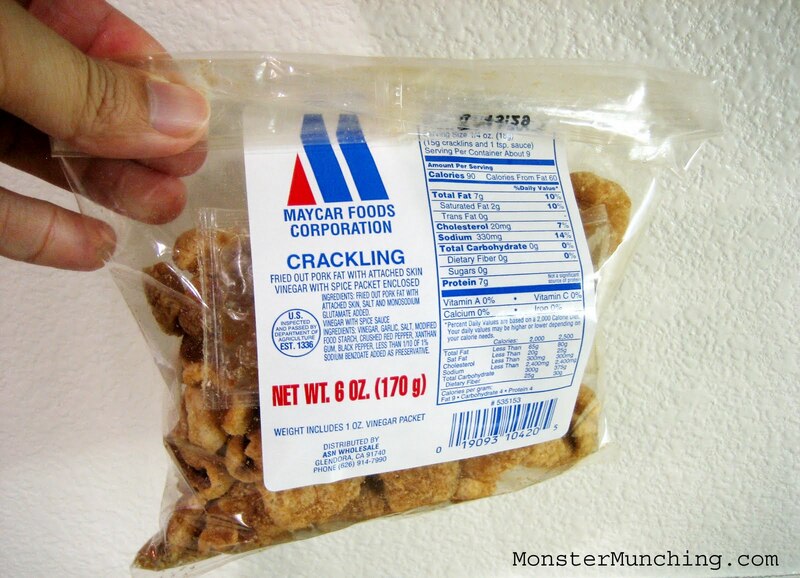 Hmmmm, maybe get some Maycar cracklings? Mang Tomas just doesn't sound appetizing with pork fat goodness. I messed up somehow, Edwin. Dunno why it posted as "Unknown". Happy new year (real name removed for privacy)! I knew it was you! Who else would know the ins and outs of MW, reads SAFII, *AND* goes to Holland America for Indo supplies? Good tip on the markets! I figured you'd know and that it'd be everywhere! I guess it goes to show that I'm at Magic Wok more than I am at a supermarket. Hence the *AND*! You are two out of three! *AND* goes to Chow King, Valero's, Red Ribbon, Toko Rame, Porto's and Kim Loan, all affordable meals (I pretend to be a college student on a tight budget). Oh how I wish I can add *AND* Marche Moderne, Park Avenue, Pascal, Lucques, etc., but for now the bucket list will have to do *AND* sallivate through these posts. ($2.99 for a 6 oz. bag). Dip in banana catchup ... "because they're really close to lechon kawale". Where's the defibrillator? 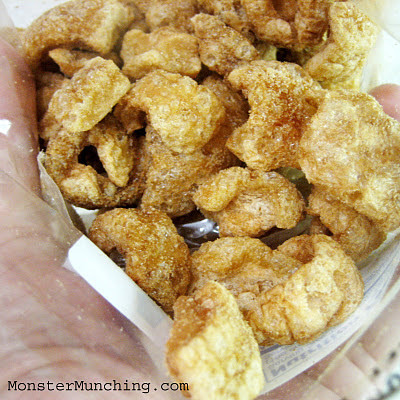 I love these pork grinds! I would ignore the nutrition facts and just eat trying to also ignore the guilt. Well, I really don't feel guilty more like loving each and every ounce of fat. Magic Wok, love that place! - Try them with lime and chili powder!